On arrival at Bangalore Airport/Railway station, our representative will pick you up and drive to Coorg. On arrival, check-in to the hotel. Remaining day is free at your leisure. However, you have the option to explore the nearby places or local market. Later return to your hotel. Overnight stay at the hotel. Take an early morning breakfast and visit Dubare Elephant Camps. On the way back to Coorg, stop at the Abbey Falls for a refreshing experience. Resume driving at the hotel and relax on arrival. The evening is free at leisure. Overnight stay at the hotel. Post Breakfast, check out from the hotel and drive to Mysore. On arrival, check-in to the hotel. 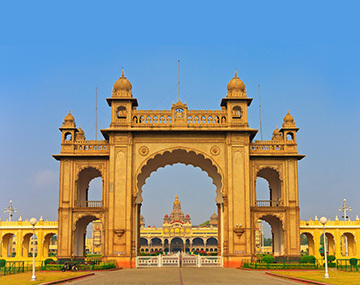 Freshen up and get ready to visit Mysore Palace, which is the biggest highlight of the Mysore tour package. Visits to Brindavan Garden and also Art Gallery are also part of your itinerary. The vacationers can also go to the Chamundi hills that offer a panoramic view of Mysore’s lakes, parks and palaces. Later return back to your hotel. Overnight stay at the hotel. Your Coorg and Mysore package from Bangalore concludes today. Post breakfast, check out from the hotel and transfer to Bangalore airport/Railway station to board a flight/train for your onward journey. While planning a weekend getaway from Bangalore, vacationers have a plethora of options to consider. With a good number of interesting destinations around, they have great opportunities to plan a trip to destinations that best suit their interests. A metropolitan Bengaluru remains abuzz with activities for most parts of the year. Most of the travelers look for weekend getaways that offer them a change from their day to day routine. Coorg and Mysore that are known for nature and culture respectively make for excellent weekend getaways. Vacationers living in Bengaluru and its neighbourhood often plan weekend getaways to Coorg and Mysore. At BookOtrip we understand the needs and expectations of the Bangaloreans and keep devising the ways to offer cheap vacation packages to Coorg and Mysore for them. With decades of experience, vast supplier network, and an inside-out knowledge of destinations, we find ourselves in a position to offer memorable experiences to our clients. Whether you are planning to soak in the immaculate natural beauty of Coorg or walk back into the history while exploring palaces and architectural marvels in Mysore our packages let you do all and more. I had a nice experience with BookOtrip while executing my coorg mysore trip. The staff to whom i communicated was very kind & polite.